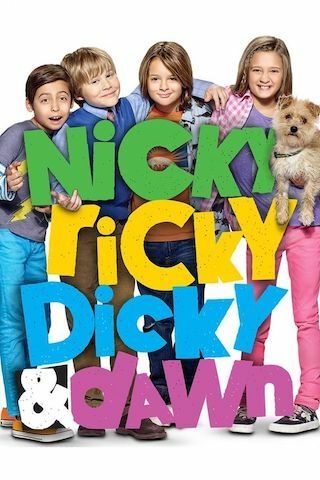 Nicky, Ricky, Dicky & Dawn is an American 30 minute scripted family television series, which kicked off on September 13, 2014, on Nickelodeon and is broadcast every Saturday at 20:00. The show is currently in its 4th season. Nickelodeon opted not to pick up Nicky, Ricky, Dicky & Dawn for Season 5. Nicky, Ricky, Dicky & Dawn officially canceled on Nickelodeon. Sign up to track down your favorite TV shows. In Nicky, Ricky, Dicky & Dawn, Dawn Harper doesn't have much in common with brothers Nicky, Ricky and Dicky except for a birthday. Sibling rivalry often consumes the quadruplets, but they can come together to solve problems that arise. Dawn acts as leader of the pack but, really, is just one of the quartet; quirky Nicky has the answer to almost everything; Ricky has a high IQ but gets into trouble with his siblings; charming Dicky always has a way with words. Situations show the preteens planning their own "grown-up" birthday parties and seeing a scary movie for the first time.